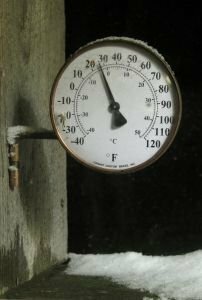 Temperatures play a critical role in how we garden. We are all familiar with the United States Department of Agriculture (USDA) Cold Hardiness zone map. A lesser known but just as important map is the American Horticultural Society (AHS) heat zone map. The USDA map deals with average cold extremes, the AHS map deals with the number of days over 86 degrees Fahrenheit that can be expected. While these maps are certainly good general guides, there are of course, exceptions to the rule. For example, the crossroads garden is about 20 miles SW of Cleveland, Ohio. We are about 15 miles from Lake Erie and about 5 miles south of the official weather reporting station at the airport. Lake Erie giveth and it taketh away. The lake acts as a thermal flywheel buffering the seasonal temperatures. There are times in the spring when we are 5-10 degrees warmer here than at the airport and times when we are 20 degrees warmer than the area around the lake shore. The reverse is true in the fall when we will experience frost before the areas closer to the lake, but the differences aren't quite as bad as the spring time. Vineyard owners take advantage of the micro-climate that exists along the south shore of lake Erie. Winter snowfall in our area can be just as extreme. Due to the geography of the area the difference in snow fall between us and areas 30-50 miles east of us is measured in feet! Even in the state of Ohio, where springtime weather and corresponding plant growth arrives in southern parts of the state about two weeks before it gets to us northerners, temperature extremes can be deceiving. Cincinnati (USDA zone 6) experiences many more days over 86 degrees (AHS zone 6) than we do each year, but surprisingly, their record low temperature is five degrees lower that that of Cleveland (USDA zone 4, AHS zone 4) at minus 25 degrees F. Remember that the different ratings measure different things and the numbers do not necessarily correspond to each other. The whole concept of micro-climates can be seen in our own yards and neighborhoods. Low areas are more susceptible to late and early frosts because cold air will settle. The east side of the house is protected from the winter winds as well as the hot afternoon sun, but sun loving plants love the west side of the house as long as it's not in the shade from the trees. While the north side of the house will have lots of shade, the opposite is true for the southern exposure, again as long as the trees don't provide shade. Ohio, Pennsylvania and New York state grape growers have used the "micro-climate" phenomenon to their advantage situating their vineyards along the lake shore to the east of us. Areas of the Midwest that are away from the Great Lakes and the buffering effects of them may experience their own unique weather patterns that gardeners need to be aware of.